With ideal – no, pluperfect – sketching conditions (for me, that means wearing a T-shirt and sandals but not breaking a sweat while sitting in the sunshine), a good turnout of Seattle sketchers showed up for an ad hoc meet-up in the Center of the Universe. The Fremont Troll has long been on my list of favorite Seattle sights to show out-of-towners. The Troll, who lives under the Aurora Bridge, was created in 1990 by Ross Whitehead, Steve Badanes, Will Martin and Donna Walter. 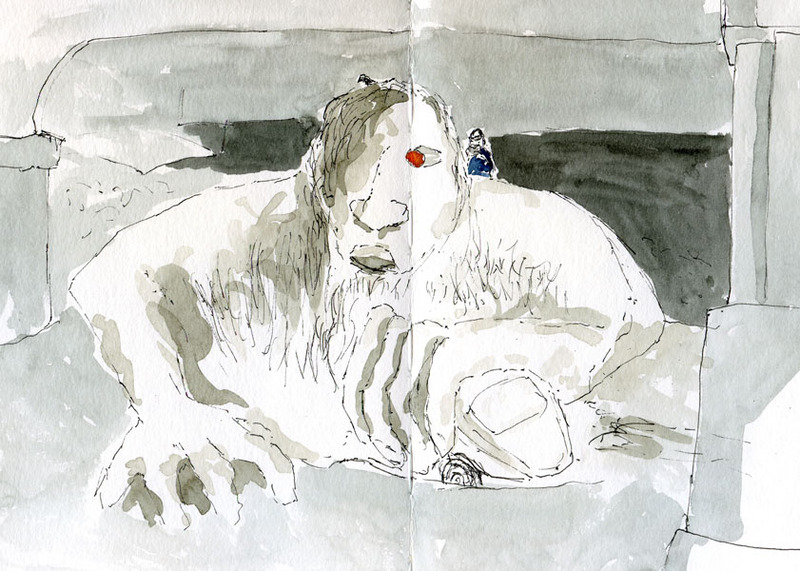 When I started my sketch, the only other person there was sketcher/photographer Gordon, who climbed behind the Troll’s shoulder to take a picture of me across the street. But by the time I was finishing up less than an hour later, I had lost track of the number of tourists who came by – some in taxis with the meter still running; others on tour buses; still others on foot. I know the Troll is supposed to be scary, ominously clutching a hapless VW Bug. But as I sketched him, I realized he has very human hands and seems more curious than scary.